We do not sell or share your your email address, or name with any third party. 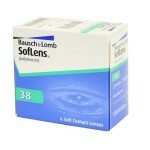 Soflens Daily Disposables by Bausch and Lomb are designed to provide the contact lens wearer with high definition vision, provide relief to allergy sufferers, and prevent complications associated with the build- up of harmful denatured proteins and bacteria. 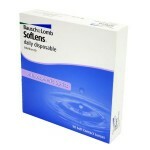 In one word, Soflens Daily Disposables can be best described as convenient. 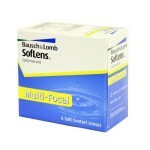 Soflens are designed to allow the patient to have the widest field of view possible and expand the area in which all light is concentrated over the visual axis. This accomplished using an aspherically designed lens. 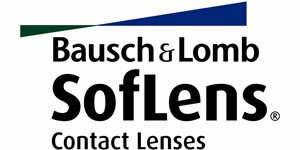 Aspherical lenses possess less curvature than a standard lens resulting in less deviation of light rays from the optical center, a wider field of view and a more comfortable contact lens edge. Additionally, aspherical lenses help the patient see better at night since they have a tendency to minimize the effects of glare and halos around light sources such as car lights. 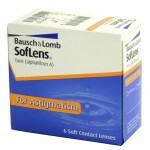 Since Soflens contacts are aspherically designed they are naturally thin. In addition to this characteristic, these lenses are treated with a patented technology known as Comfort Moist. This lens possesses a hydrogel substrate that is chemically treated with a highly viscous outer coating. 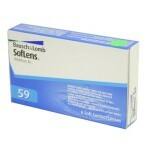 This allows Soflens to remain comfortable throughout the day. The surface also resists the buildup of protein deposits which will often cause the surface of the cornea to warp inducing unwanted irregular astigmatism. The greatest benefit of these lenses is the fact they are disposable. Whether than worry about cleaning regimens, protein build-up, bacterial colonization and allergens, these lenses can be tossed out a day’s end and a new pair inserted the following morning. This allows for a level of convenience not enjoyed by traditional planned replacement lenses.